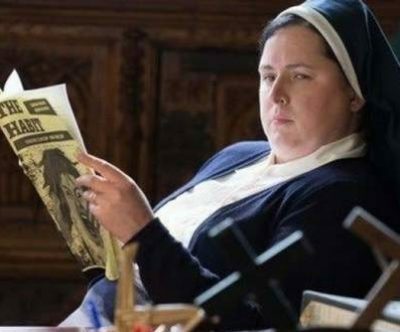 Siobhan McSweeney plays Sister Michael in Derry Girls. Northern Ireland’s pro-life agency Precious Life has sharply criticised actresses from the hit TV show Derry Girls for using their success as a platform to promote abortion. Next Tuesday, two actresses from the hit comedy show will take part in a demonstration at Westminster, demanding changes in Northern Ireland’s abortion law. Nicola Coughlan, who plays Clare Devlin in the popular Channel 4 series, and Siobhan McSweeney, who plays Sister Michael, will join 26 other women in a symbolic protest marching across Westminster Bridge carrying suitcases to symbolise the number of women who travel outside Northern Ireland each week for an abortion. The protest is organised by Amnesty International, which describes abortion as a “basic healthcare need”. “It’s truly disgusting that these actresses are abusing their very public profile and platform to promote the killing of defenceless unborn babies,” said Bernadette Smyth from Precious Life. Ms Smyth described the actresses’ involvement in the protest as a “publicity stunt”. She said an estimated 100,000 people were alive today because of Northern Ireland’s existing laws. Ms Smyth said the actresses should “consider using their gifts and talents to instead promote better support services for women finding themselves in unplanned pregnancies”. She said a more compassionate response to unplanned pregnancy would be to “support women feeling powerless and afraid so that they feel empowered to choose life and protect their own well-being also”. She said it was never compassionate to destroy a human life. Meanwhile, Pro-Life Campaign has appealed to pro-life graduates of the National University of Ireland and Trinity to register so that they can vote in the next Seanad elections. In a recent action alert, the agency said it had become aware of an “aggressive and what seems to be a very well-resourced campaign” to unseat certain pro-life members of the Oireachtas, in particular Senater Rónán Mullen, with a voter registration drive before the closing date of 26th February. “If you don’t want to see all pro-life voices driven from politics, take action today. If you’re an NUI graduate but not registered to vote, please register today,” said a spokesperson for the PLC, who also noted that there was no pro-life voice among the senators currently representing Trinity College Dublin in Seanad Eireann. The PLC is happy to provide information on how to register for Seanad elections at 085 192 0160.